As we predicted, Common Core Standards would be used to turn students into political activists. Gone are the days of educating students in the core academic subjects and allowing them to think for themselves. Common Core is more about pushing kids to become political activist at the expense of literacy. We know that many high school grads are NOT reading the U.S. Constitution or other important founding documents. In states like New Hampshire, our Social Studies “Standards” were rated at an “F” level. In other words, our kids are not learning the core academics in important subjects like Civics and U.S. History. Now, the Common Core Standards will ignore the problems of illiteracy in these subjects and exacerbate the problem. How? By requiring students who may not have a solid academic foundation, to lobby their elected officials AND debate political issues. Look at what kids in 1954 on an 8th grade civics test had to know and ask yourself, are our children learning this important information first? Are the schools equipping students with knowledge so at some point, they can debate important political issues? Or are they denying them core academic content and allowing students to be used as political activists, not based on facts and information but on emotions and feelings? Whatever your position is on gun control, let’s make sure our schools are first educating our kids and giving them a foundation of knowledge. Then they can form their own opinions. Or is that what they are trying to stop? This entry was posted in Academic Freedom and tagged 1954, Commoncore, GunControl, KennyHignite, PoliticalActivists on October 17, 2015 by SCC. We hope Governor Hassan and Commissioner Barry will issue a STRONG stance against the bullying of any teachers in New Hampshire who publicly speak out on the problems they are seeing with Common Core. We’ve had some courageous teachers in New Hampshire speak out against Common Core and it is necessary to support these teachers. Parents need to hold their school administrators accountable if there is any kind of bullying against these courageous teachers. 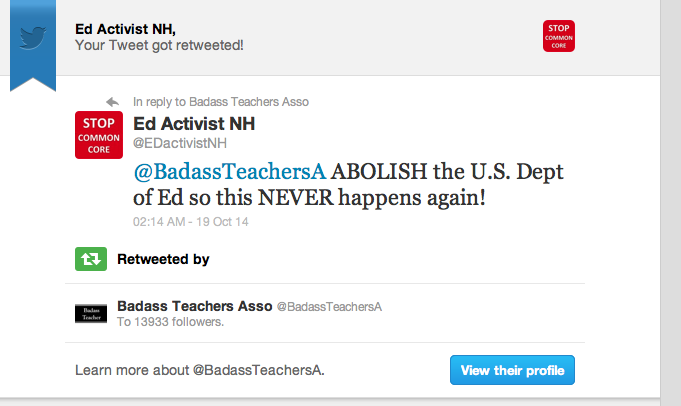 You can do that by going directly to your local school board if you are aware of any bullying against teachers. Writing letters to the editor of you local papers and contacting you local elected officials can also be helpful. We need to stand together to support the teachers who are willing to share the information that puts our children in a harmful situation. PHOENIX – A Tucson teacher who says he suffered retaliation from state Department of Education staffers because his opposed Arizona’s new Common Core standards is suing the state. The suit says McQueen was removed from his committee roles earlier this year after he spoke out against Common Core and its accompanying tests in a newspaper story. Goldwater attorney Kurt Altman says the removal and notes placed in his file violate McQueen’s free speech rights. This entry was posted in Academic Freedom, Teachers on December 5, 2014 by Admin. We all know that teachers who oppose Common Core are SILENCED. We also know that Governor Hassan has ignored the serious problems with the Common Core Standards. Thank you, Governor Jindal, for protecting teachers and allowing them to use their voices to speak out on behalf of our children. WHEREAS, teachers are the backbone of Louisiana’s educational system and offer a necessary voice in the ongoing discussions regarding classroom curriculum and testing procedures and must be afforded the opportunity to offer this crucial perspective; …. This entry was posted in Academic Freedom, Political, Teacher Opinion, Teachers and tagged Academicfreedom, GovernorHassan, GovernorJindal, Teachers on October 13, 2014 by Admin. The AFT put Duncan on a “Secretary of Education Improvement Plan.” If he doesn’t improve, having been treated fairly, asking him to resign. Don’t miss the comments from the rank and file teachers at the bottom. This entry was posted in Academic Freedom, Teachers and tagged AFT, ArneDuncan, Commoncore, Teachers, union on July 13, 2014 by Admin.